I recently looked at the change in government employment over the years. I thought it would be interesting to look at a 'now and then' comparison of the labor force from 50 years ago in 1962 versus today. Most of the employment numbers I got from the BLS CES page. I used the 'multi-screen data search' to get historical figures for government and non-government employment. I also used the numbers for uniformed military and Dept. 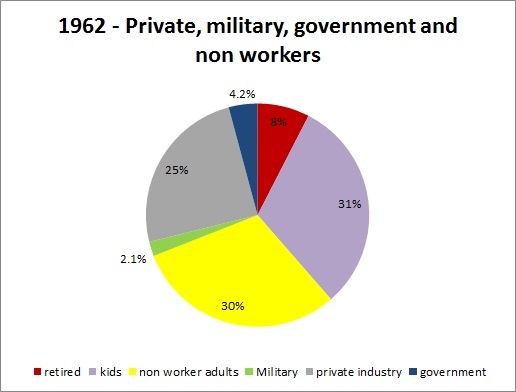 of Defense civilian employees from my previous article and then added those to get the total military personnel. I used BLS site to find the labor force participation rate for people over 65 then figured the number of retired workers by multiplying the labor force participation rate of people over 65 versus the total population over 65. The total population, and how it breaks down by age is off Census sites including the American factfinder. I used 2010 numbers for age % and I used the 2007 military numbers. So both those details are a bit off from the actual 2012 numbers but close enough. 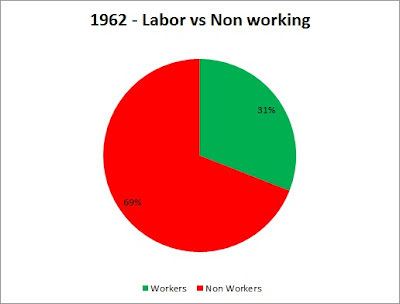 Wow, less than 1/3 of the population worked back in 1962. A lot of that is due to more 1 job families then as well as more children. 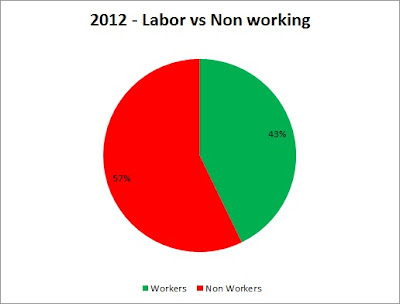 A lot more people work now. 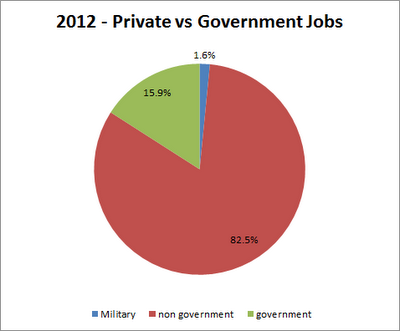 Private employment and government employment have increased but the military employment has dropped. Among the non working population there are fewer children and more retirees and fewer portion of the adult age population is non working. More of the labor force is in private industry and we have fewer people in the military. Military dropped significantly from '62 till today. The USPS was cut in half. Federal jobs excluding military and USPS dropped a little. Other state government jobs were flat as a % of all jobs and local government jobs were up a bit. Educational jobs at the state and local level both grew significantly. 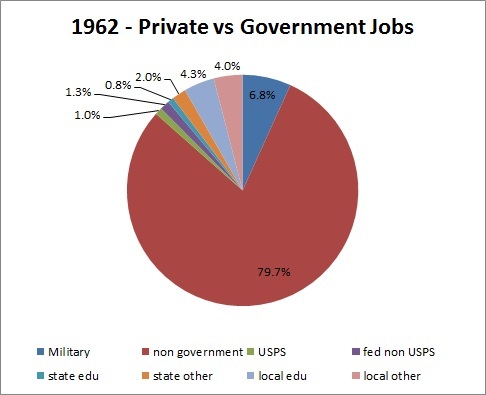 In 1962 we had about 2.9 million jobs in state / local education representing 5.1% of the workforce but by 2012 it had grown to 10.2 million workers which is 7.7% of all jobs. This bit of information seems noteworthy and I will likely dig into this further in another article to try and see exactly why there are so many more education jobs.